Y-D Red Sox slugger Jason Cooper delivered blast after blast to earn the 2000 Sprint PCS Cape League All-Star Game Home Run crown Saturday at Brewster Whitecaps Field. 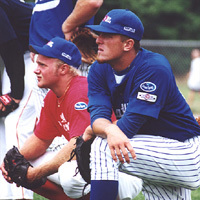 For more Cape League All-Star Game photos, see Photos 2000. It appeared to be predestined that the sun would shine upon Brewster Whitecaps Field at Cape Cod Regional Technical High School Saturday, as some 4,000-plus Cape League fans scooped up every available seat in the house to watch the 2000 Sprint PCS Cape League All-Star Game. Following the superb efforts of Cape Tech athletic director Barry Souder and crew to remove rainwater from the Whitecaps' diamond, the East and West Division all-stars wowed the crowd with a terrific Home Run Hitting Contest which at first appeared to belong once again to Falmouth's Doc Brooks. Yes, University of Georgia's Brooks swatted seven bombs into the trees and fans' awaiting outstretched hands in round one of the annual long ball extravaganza, and for all intents and purposes it appeared he would repeat his stunning home run display of 1999. Alas, Y-D Red Sox slugger Jason Cooper, a freshman from Stanford University, would have none of it and after hitting three homers in round one, returned in round two to swat six titanic blasts from the left side of the plate, edging Brooks in round two, 6-3. Other home run contestants included Chatham A's' Todd Linden, Y-D slugger Travis Wong, Falmouth's Luke Scott and Cotuit Kettleer Daylan Holt. Cotuit Kettleer righty Ryan Combs may have given up a solo shot to Brewster's Ryan Stegall, but he was nevertheless impressive on the hill for the West Division squad. The pre-game favorite to win the annual Home Run Hitting Contest, Chatham slugger Todd Linden delivers a deep blast over the rightfield wall. Following the home run display, as the Philly Phanatic ran rampant through the amused crowd, the ceremonial first pitch was thrown by Brewster Board of Selectmen chairman John Mitchell and Chatham A's ace and East Division All-Star starter Dan Krines got to work mowing down the West. It wasn't until Harwich Mariner all-star and East Division MVP Ryan Stegall jacked a solo shot deep off Cotuit Kettleer righty Ryan Combs in the bottom of the fourth inning that the scoreboard ice was broken and the East enjoyed a brief, 1-0 advantage. 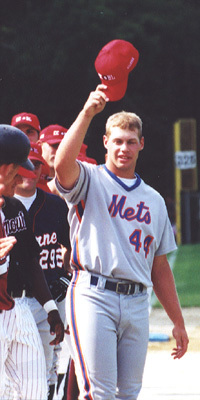 But then Hyannis Mets' and Notre Dame's Brian Stavisky came to bat in the top of the sixth inning for the West Division all-stars. Facing hard-throwing Y-D righty Jake Gann, Stavisky turned on a blazing, waist-high heater and took it way downtown with two men on. The West was suddenly ahead, 3-1, and Stavisky would later in the day garner West Division Most Valuable Player honors for his effort. West Division All-Star Most Valuable Player Brian Stavisky put the West ahead, 3-1, in the early goings of Saturday's big game, when he crushed a waist-high fast ball deep and out of the ballpark. 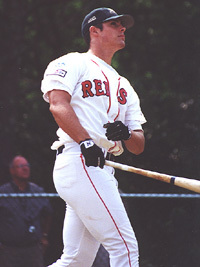 1999 All-Star Game home run champ Doc Brooks jacked seven wonderous bombs into the trees in round one of Saturday's all-star game. 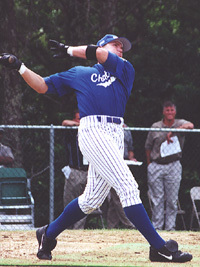 Brooks was the first-ever Cape Leaguer to return to defend his all-star game home run title. The West and East swapped solo digits in the seventh inning to make it 4-2, followed by two more West team runs in eighth. Carrying a 6-2 lead into the bottom of the ninth, the West appeared ready to take home victory when the East broke things open, came from behind to tie it at 6-6 on a bases-loaded double by Orleans Cardinal and Georgia Tech catcher Bryan Prince, and then captured the 7-6 win on a bases loaded walk to Harwich Mariner Jason Bartlett. 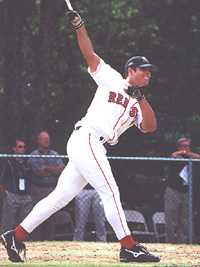 With stopwatches, clipboards, camcorders and tape recorders jug-guns in hand, a total of 78 Major League scouts were in attendance at the 2000 Sprint PCS CCBL All-Star Game. Cape Regional Technical High School athletic director Barry Souder actually had to change clothes after working so hard to make sure the field was ready for the all-star game last Saturday. A tip of the hat to Mr. Souder. WEEI sports talk show radio personality Glenn Ordway did a fabulous job as the master of ceremonies for the 2000 Sprint PCS Cape League All-Star Game, as did the voice of the Brewster Whitecaps Jim Nowak in announcing the play-by-play. 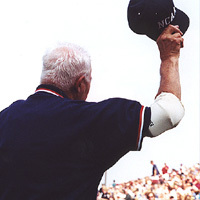 The estimable Curly Clements tips his hat to the 4,000-plus fans during introductions at Saturday's Sprint PCS Cape League All-Star Game at Whitecaps Field. Clements, 81 years old, came out of retirement for a day to call balls and strikes for the all-star game. 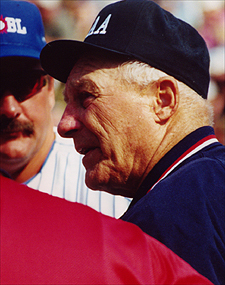 Retired Umpire Hall of Fame member Curly Clement, at 81, was a natural behind the dish calling balls and strikes for Saturday's all-star game, and was brought to tears at home plate when going over lineups and ground rules with Cotuit coach Mike Coutts and Chatham coach John Schiffner. Howard Wayne and Legal Seafoods came through in the clutch for an excellent post-all-star game clambake, while 2000 Sprint PCS Cape League All-Star Game Committee Chairman Linda Reidl and utility man Don Tullie deserved much praise for their game organization efforts. 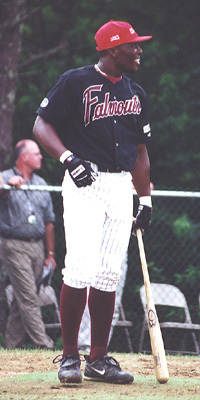 Photo by Sean Walsh With Falmouth Commodore swat king Doc Brooks in the Home Run Hitting Contest lead with 7 blasts, Stanford's Jason Cooper made mincemeat of the ball, wowed the 4,000-plus fans with his titanic home runs and became the new reigning Cape League All-Star Game home run champ. 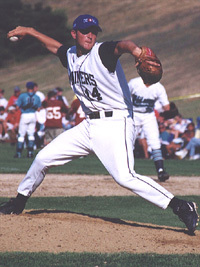 Photo by Sean Walsh Harwich Mariner ace Kevin Downes brought nothing but smoke to the 2000 Sprint PCS Cape League All-Star Game..
Orleans to host Team USA vs Chinese Taipei game. The Orleans Cardinals organization is also hosting a game of, well, international proportions. Infield practice for both teams is tentatively scheduled for 6:15 with the first pitch at 7:30 p.m. Schedule change: The game between the Cards and the Falmouth Commodores will start at 3:00 p.m.
East Division starting all-star pitcher and Chatham A's' Dan Krines (right) and Cape League top closer Taft Cable of the Orleans Cardinals ready themselves mentally for the big game. Call the police, there's been a theft...Actually there was more than one theft when the Wareham Gatemen ran wild last Sunday against Bourne. In the game, the Gatemen stole 13 bases (the old record was 9) in 17 attempts (the old record was 10). Nick Swisher (Columbus, OH/Ohio State) lead the way with four. He's out, and he's out...In the same game that Wareham set a new CCBL record for steals, the Gatemen also tied the record for double plays turned - their six ties the mark set back in June of '94. The Cape League is pleased to announce the Coke Hitter and Pitcher and the Home Run Hero for the week of July 16-July 22. The Coke hitter is Bourne's Jon Benick. Benick, who hails from Glen Lyon, PA hit .438 in four games (7-for-16) with a home run and 4 RBI. He also scored 3 runs. 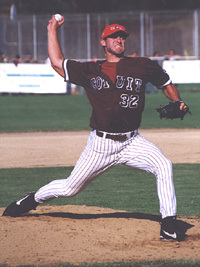 The Coke pitcher is Orleans' Brett Lewis. Lewis (Jonesboro, GA/Georgia Southern) was 1-0 on the week. In 8 innings, he allowed two runs (1 earned), walked two and struckout 10. The Home Run hitter is Brewster's Paul O'Toole. O'Toole, a CCBL All Star and USA vs CCBL All Star recorded one roundtripper on the week. O'Toole is from Lakewood, OH and plays college ball for Notre Dame.